Type M-x package-install RET anything-git-files RET. 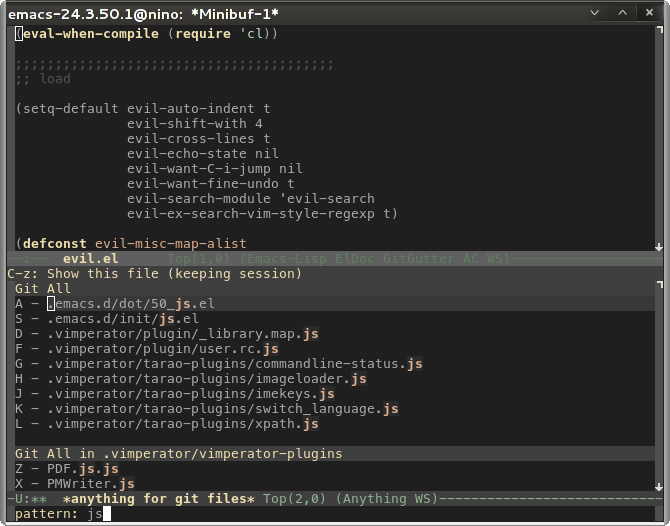 Then, M-x anything-git-files will list the files in a git repository. Note that M-x anything-git-files will fail when the file of the current buffer is not in a git repository. The anything sources to get files in a git repository are anything-git-files:modified-source, anything-git-files:untracked-source and anything-git-files:all-source. The list of anything sources for submodules can be retrieved by function anything-git-files:submodule-sources. The function takes one argument, which is a list of symbols of source type, modified, untracked or all. For example, (anything-git-files:submodule-sources '(untracked all) returns anything sources for untracked files and all files in the git repository of the submodules.